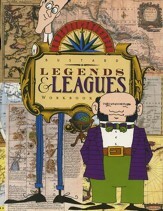 The Legends and Leagues grammar-level geography curriculum from Veritas Press. It is comprised of five levels in total--one initial level for Grade 1, and four named after the cardinal directions (grades 2-5), each of which requires a book and workbook. It is recommended that levels be completed in the order of: Legends & Leagues (Grade 1), South (Grade 2), East (Grade 3), North (Grade 4), and West (Grade 5). The Audio Memory Geography Songs is suggested for all levels, along with the States & Capitals CD for grades 1 & 5. When Elmo Tardy stumbles into the office of Mr. Meridian Longitude and Mr. Azimuth Latitude, it's quite the meeting. Mr. Tardy explains he's always lost, and therefore always late, and his two new acquaintances take it upon themselves to explain maps and globes and cartography in an effort to help him understand where he is and where he wants to end up. This enjoyable tale is a wonderful way to introduce concepts such as scale, types of maps, compasses, cardinal directions, hemisphere, continents, oceans, and more, all in a way that any young child can understand. Grade 1. 32 pages, softcover. This workbook accompanies the Legends & Leagues Storybook from Vertias Press (sold-separately), and provides fun projects and exercises that reinforce the geography concepts introduced in the book. Children will complete activities such as creating a room map, making a magnetic compass, using coordinates to label cities, drawing state landmarks, and more. 44 classroom/family-reproducible pages with glossary, softcover. 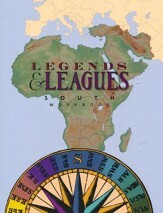 Legends & Leagues, Ltd. provides geographic services for anyone who needs help knowing how to get from Here to There. Using their old and new maps, Mr. Latitude and Mr. Longitude are able to take their clients anywhere, anytime. In this story, they travel south with the flighty lost boy, Peter Pan. Their adventures include pirates, magic carpets, King Solomon, a merman, a jinni, a sphinx, and yes-even a hippopotamus. The Legends and Leagues grammar-level geography curriculum from Veritas Press is comprised of one introductory course (Legends & Leagues - Grade 1) and four levels named after the cardinal directions, each of which requires a book and workbook. It is recommended that levels be completed in the order of: South (Grade 2), East (Grade 3), North (Grade 4), and West (Grade 5). For this level, the Audio Memory Geography Songs is also suggested.This workbook includes comprehension worksheets with vocabulary for each chapter of the storybook, along with maps and study questions of each region. Optional activity worksheets, such as Local Flavor, Legends, Sightseeing, and Souvenirs. The Legends and Leagues grammar-level geography curriculum from Veritas Press is comprised of one introductory course (Legends & Leagues - Grade 1) and four levels named after the cardinal directions, each of which requires a book and workbook. It is recommended that levels be completed in the order of: South (Grade 2), East (Grade 3), North (Grade 4), and West (Grade 5). For this level, the Audio Memory Geography Songs is also suggested. 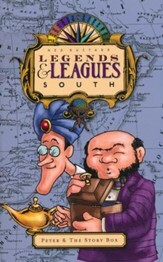 The East Storybook follows Mr. Longitude and Mr. Latitude as go east with a girl named Momochan to attempt to defeat the evil beast called a bunyip. As they journey from place to place they encounter dragons, fairies, baku, kangarros, a terra-cotta army, and even Captain Nemo. 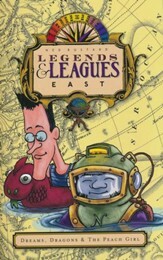 Geography activities can be found in the Leagues & Legends East Workbook (sold-separately). 62 pages, softcover. Grade 3. 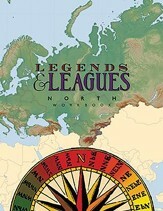 The Legends and Leagues grammar-level geography curriculum from Veritas Press is comprised of an introductory course (Legends & Leagues - Grade 1) and four levels named after the cardinal directions, each of which requires a book and workbook; the Audio Memory Geography Songs is also suggested. It is recommended that levels be completed in the order of: South (Grade 2), East (Grade 3), North (Grade 4), and West (Grade 5). This East Workbook is designed to be used with East Storybook (sold-separately), and includes full-color worksheets that cover vocabulary, comprehension, map work, and study questions based on the region. Optional activity worksheets (such as Local Flavor, Legends, Sightseeing, and Souvenirs) are also included, along with quizzes and two tests. Scheduling can be altered to best suit your family; this workbook can be compressed into a single semester, or taught over a full year, at the pace of working two days every other week. Line listed answer key included. 159 non-reproducible pages with glossary, softcover; consumable workbook. Grade 3. The Legends and Leagues grammar-level geography curriculum from Veritas Press is comprised of an introductory course (Legends & Leagues - Grade 1) and four levels named after the cardinal directions, each of which requires a book and workbook. It is recommended that levels be completed in the order of: South (Grade 2), East (Grade 3), North (Grade 4), and West (Grade 5). For this level, the Audio Memory Geography Songs is also suggested. 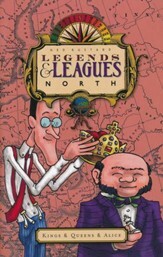 This North Storybook follows Mr. Longitude and Mr. Latitude as meet a young girl named Alice as they travel by map to find the Loch Ness Monster. Along the way they meet St. George, King Wenceslas, and a witch-though unfortunately no Jabberwockys. 62 pages, softcover. Grade 4. This North Workbook is designed to be used with the North Storybook (sold-separately), and includes full-color worksheets that cover vocabulary, comprehension, map work, and study questions based on the region. Optional activity worksheets (such as Local Flavor, Legends, Sightseeing, and Souvenirs) are also included, along with quizzes and two tests. Line listed answer key included. 159 non-reproducible pages with glossary, softcover; consumable workbook. Grade 4. 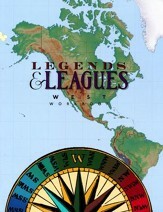 The Leagues and Legends grammar-level geography curriculum from Veritas Press is comprised of an introductory course (Legends & Leagues - Grade 1) and four levels named after the cardinal directions, each of which requires a book and workbook. It is recommended that levels be completed in the order of: South (Grade 2), East (Grade 3), North (Grade 4), and West (Grade 5). For this level, the Audio Memory Geography Songs and States & Capitals Songs are also suggested. 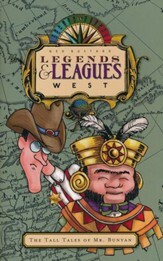 This West Storybook follows Mr. Longitude and Mr. Latitude as they travel west with a world-famous lumberjack in search of a certain missing blue ox. They visit El Dorado, the Amazon River, Atlantis, and New York, meeting all sorts of friendly and fantastical creatures along the way. 64 pages, softcover. Grade 5. 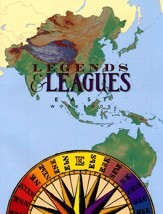 The Legends and Leagues grammar-level geography curriculum from Veritas Press is comprised of an introductory course (Legends & Leagues - Grade 1) and four levels named after the cardinal directions, each of which requires a book and workbook; the Audio Memory Geography and States & Capitals Songs are also suggested. It is recommended that levels be completed in the order of: South (Grade 2), East (Grade 3), North (Grade 4), and West (Grade 5). This West Workbook is designed to be used with the West Storybook (sold-separately), and includes full-color worksheets that cover vocabulary, comprehension, map work, and study questions based on the region. Optional activity worksheets (such as Local Flavor, Legends, Sightseeing, and Souvenirs) are also included, along with quizzes and two tests. Line listed answer key included. 161 non-reproducible pages with glossary, softcover; consumable workbook. Grade 5. Memorization is always easier with music! Audio Memory helps enhance students' memory skills by setting geography facts to music. Geography Songshas been updated and now includes 34 songs that teach the names and locations of the continents, oceans, 225 countries, and even the planets. Students first listen to the CD, then point out the names and locations of the countries on the included map. Labeling and coloring the maps in the workbook will also help with reinforcement and geography mastery. Help children easily learn the names and locations of the fifty states and their capitals with the catchy music of Audio Memory! 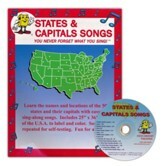 States & Capitals Songs includes 10 songs and 4 test songs which teach children the states by region: the northern border, the southern border, the eastern border, the middle and the Pacific states. After students learn the states, they learn the capitals in the same order; during the test, they have to remember both the name of the state and the capital as they move from west to east. Songs are different, and repeated with a pause before the answers are provided, allowing students to self-test their knowledge. This map is numbered in the same order that the locations are sung in the songs, making it easy to locate the locations while you are singing. Students can color the map while they listen to the songs. The lyrics of the songs are on the map, making it easy for students to point to locations while they sing.